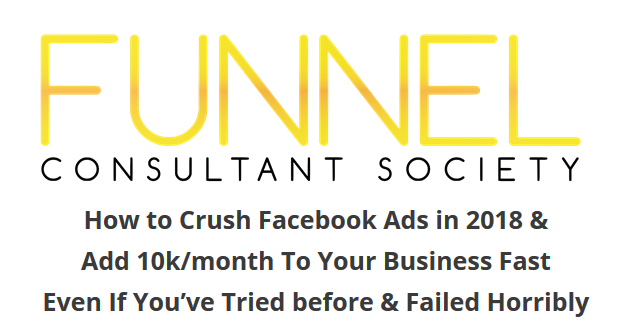 Funnel Consultant Society is our flagship Facebook ads program that walks you through the winning combinations of setting up and managing Facebook ads that convert. FCS (Funnel Consultant Society) gives you the the templates, landing pages, ad copy, and targeting to begin generating leads on demand! You don’t need to guess your targeting… You don’t need to be confused inside business manager. You don’t need to spend hours coming up with the perfect ad copy. You won’t have to design new landing pages. None of that. Instead we provide you the training, ad copy templates, video templates, landing page templates, and support to crush Facebook ads for yourself and for your clients! In a nutshell, we help you acquire the skillsets that all 7 and 8 figure marketers share. That is Facebook advertising. Now if having all the solutions at your fingertips sounds like a match made in heaven; then please read on to see more details about our program. It is the newest and most updated Ads program to market and the results from our members are flying in! Lets take a look at each core module. Module #1: The Fast Track – focuses on understanding the Facebook auction, Facebook audience “buckets”, setting up your Facebook pixel, covers Facebook’s ad guidelines so your account isn’t banned, and introduces you to Ads manager. In this section you’ll learn what types of campaigns to run for new campaigns such as when to run a Traffic campaign vs Engagement Vs. Conversion. Module #2: Basic Targeting – focuses on all of the targeting and placement options inside ads manager. This is where you’ll spend the majority of your time with Facebook ads so it’s important to know inside and out. We’ll cover the most common Facebook Advertiser mistakes, targeting you didn’t know existed, ad placement such as should you use the audience network, and more. Module #3: Advanced Targeting – begins to show you more strategic advertising options including lookalike audiences, custom audiences, retargeting ads, and engagement campaigns. This is where you learn how to utilize client assets like their email list to get instant results. Module #4: Types of Facebook ads – Introduces you to the various types of ads you can run from static image, video ads, carousel ads, messenger bots, and leads ads. (MSG bots & Lead ads coming June 2018). You’ll see which types of Facebook ads to run and when. Module #5: Optimization Tricks – Reveals how to make your Facebook ads convert, how to approach A/B testing correctly, how to write ad copy, and how to optimize your campaigns to get better each day. We’ll cover setting up your Facebook ad “pilot cockpit” so you track your results and more. Module #6: Client Management – Covers how to use business manager to manage multiple client campaigns from 1 dashboard, how to forward leads to a client, what types of clients and niches to approach, proposals to use, and softwares to manage several clients simultaneously. Receive the templates, sales scripts, and exact tactics we use to have a stream of clients on demand whenever you choose. This module will leave you in a position to go sign a client at the snap of your fingers. This is one of our member’s favorite modules that they rave about. Once your clientele roster begins to grow you’ll need strategies to save as much time as possible. In automation mastery we cover the tools, softwares, and training necessary to maximize output with automating as much of your ad management as possible. The great thing about Facebook advertising is a lot of it can be automated. Follow carefully crafted and well designed cheat sheets that our agency uses to train staff so they can easily setup a new campaign from start to finish flawlessly. Each guide includes screenshots and directional arrows walking you through the process of setup. With these timeless guides, you’ll never need to rewatch a video. Pass cheat sheets off to a virtual assistant or employee to grow even faster. Mesmerize Your Prospects With Our Client Acquisition Funnel & Have Them Psychologically Pre-sold on your Services & Expertise. The exact funnel that our client member, Andrew Mcburney used to collect 10 leads and 3 new clients with $17 in ad spend! The funnel pictured below is blurred out for member protection is quite different in flow otherwise. A Technique that will make your Facebook Ads go mini-viral. We’ve coined this strategy, “Facebook ad stacking”, and this tactic alone will cut your cost per lead in half. An efficient and easy to follow tactic that will instantly boost the performance of your campaign. FB ad stacking is how some ads online end up with 100’s or 1000’s of comments, likes, and shares. Checkout the social engagement on ads from our campaigns below. As you can tell by the “Nursery ad” the niche doesn’t matter, this works. Clearance to Join 6 and 7 Figure Funnel Consultants on the inside of our tribe’s Facebook group for the type of support that can make or break your campaign’s success. When you have a question, our support is standing by. Masterminds charge $10,000+ for the ability to have this type of access. Worried that your niche or campaign is “too unique”? It’s not. Jump onboard a 25 minute 1v1 call with me and I will personally help you setup your campaign. We can dial in your offer, targeting, funnel, ad copy… you name it. We’ll nail it. No other program offers a 1v1 call. I want your results and your testimonial that bad. The funny thing is I often take consulting calls for $1,000/hour from other agency owners. You get the call, FREE, with your members. Then to top it off you will receive a recording of the call to go back and pick up all the details. Note: These calls are recorded for all members to review and in addition, you get to review their calls. When you join, you become part of the tribe & to demonstrate our dedication to your success & growing our community we’ll ship you a t-shirt, FREE. This is not just any t-shirt I’ll let you know. They are form fitting and read “funnel Consultant” on the front. Wear this out in public and to networking events and have potential clients approach you. it's HQ Domain To [COLOR="rgb(46, 139, 87)"]make money[/COLOR] online You can make website and stream Movies or anything in this niche . Oh Yeah Baby ... !!! Are you unsure where to start or how to scale? I can probably help you! All times are GMT +6.5. The time now is 05:09 PM.